I'm catching up on a few things! First of all, I have a new article in a special Japan Times supplement. It tries to answer the question, "What is washoku? 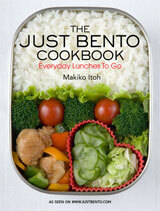 ", or traditional Japanese cuisine. Back in December (previously) washoku was designated as a UNESCO Intangible Cultural Heritage of Humanity, and this is more about the subject. Also (and I am a bit late posting this...) from this month my regular Japan Times column will have a recipe with the article. First up is an article about the different kinds of winter citrus fruit that you can get in Japan, plus a recipe for yuzu marmalade. Marmalade made with yuzu fruit is truly outstanding - so fragrant, with just a right amount of bitterness - so I hope you'll give it a try! If you want to do something even simpler, try making yuzu-cha or yuzu tea. 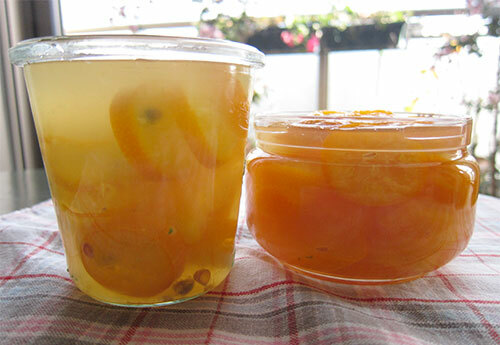 All you do is to freeze some roughly cut up yuzu, then add it to a sterilized jar. Add half its weight (or as much as you like) in sugar, and leave it somewhere where you will see it every day. You should use granulated or castor sugar (superfine sugar). The yuzu is frozen to break down its structure so that it releases more juice and oils, but you can just it fresh if you like. Give it a good shake at least 2-3 times a day until the sugar has melted. You can use the whole fruit, as shown in the photo below (the container on the left), or use the peel only and the juice for something else. Store the jar in the refrigerator once the sugar has melted. The yuzu-cha is added to hot water or tea to make a sweet 'tea', which is really refreshing. Try a tablespoon or so in a mug with boiling water. An even easier way to enjoy yuzu year-round (especially if you are trying to stay away from sugar...) is to peel off the yellow part or the zest thinly, and to just freeze it. You can julienne or chop it up if you like before freezing, or cut it up as you like when you use it. It adds that wonderful yuzu fragrance to soups and vegetable side dishes, to grilled or simmered fish, or anything you like. A bit of the peel floated on a cup of hot tea is really nice. We can get very expensive fresh yuzu here in France...it costs the earth, but I buy a few just because that fragrance is so irresistable. And finally: just for people who have been kind enough to send me words of encouragement -- I just have two more seeks to go of this latest round of radiation therapy. It is making me kind of sick again but I can see the light at the end of the tunnel. Hopefully by spring I'll be out and about again! Submitted by maki on 2014-01-24 16:45.
had a yuzu-cha at my birthday kaiseki the other day. yummy. I wish I could find yuzu fruits in London! To my delight I was able to purchase a yuzu tree here in NZ (Kiwis: check Trademe). I've had it growing in a large pot about 5 years and last year it had 6 beautiful fruit, sadly this year there are none. As my other citrus trees have a tendency to go well one year not so well the next, I am not fazed and will look forward to the next round of fruit. Thank you for the tea and marmalade ideas. I must say it is very hard not to treasure it. The freezer has been my storage friend. (Another thing I have been glad to freeze has been pomengranate seeds, thanks to Clothilde's note on her C&Z blog, no treatment, just pop them in a bag and thaw as required. I thought they'd be damaged but no, they are acceptable). I'm a huge fan of yuzu-cha! Totally interested in a kinkan recipe, please! I thought caster sugar was the English/UK reference for granulated sugar, and that superfine is a grind somewhere between caster and icing sugar (known in the States as powdered sugar)... meaning caster = granulated ? I've checked it but may be wrong, anyone know for sure? And YES, would love to hear your take on kumquats in syrup - thanks as always, Maki-san! Granulaed has bigger grains (intact crystals I think); castor has a finer grain and is a bit moist; superfine is a bit finer than castor. Castor (also spelled caster) is not that available in the US so usually superfine is the preferred substitute. In Japan, the equivalent to castor sugar is 上白糖 (jouhakutou), which is the "basic" default white sugar. This looks wonderful! Thanks so much for posting! Yes! I only had yuzu marmalade once and it was so wonderful..I wonder if any of your readers know where, in Canada, yuzu or yuzu marmalade can be bought. I make my own seltzer from distilled water - so no sodium. I add it to a spoonful of store-bought "citrus tea" for a wonderful drink. Citrus tea is one or a combination of Japanese fruits and is bitter, sweet and sour. We are fortunate in Southern California to have Asian markets in many areas. I adore yuzu! Weirdly, even though I only went to Japan for the first time in 2012 (and again in 2013), when I taste yuzu it fires some kind of recognition radar in my mind, like it's deeply familiar, deeply nostalgic, one of those flavours that take you back to childhood. Yet I was born in London 40+ years ago, grew up here, went to India (where my family are from) regularly, but I don't think any of our Indian citrus are yuzu like. I do not know for the life of me why this one citrus resonates so strongly in my taste memories. I wish we could buy it fresh here, without paying a fortune, as I'd love to make some of these recipes. Wishing you strength and comfort for your continued treatment and good health for 2014. Sounds like you're rounding the bend (old western saying) with your treatments. And just in time for spring to greet you with sunshine's warmth and nature's elegance on show. You, too, will thrive. Truly admire you from SF, USA. I too am interested in kinkan/kumquat. I see many recipes for it in preserved in sugar syrup but what does one do with the preserves?! I'd love to try it but don't know what to do with it once it's made. Are there other ways to enjoy it as well? I have 2 Yuzu trees that I put out each summer and take in over the West Virginia mountain Winters, where they limp through the cold months and survive onslaughts of scale (with the help of regular applications of Neem oil, and tedious manual removal of the adult scale) until it is warm enough overnight to put them back outside. Despite these less-than-ideal circumstances, I harvested about a dozen fruits last year (only 1 this year) and I preserved those in salt, like preserved lemons. Perhaps next year, if they bear a reasonable number of fruit, I'll try this. Even the large Korean Groceries in Fairfax Virginia do not seem to carry Yuzu, so raising the plants was the only way I could get to know these wonderfully fragrant citrus. Hope to bring delicious-looking yuzu products back home from NYC ~ perhaps I can carry them in my suitcase, save on shipping . . .
More strength to you ~ have enjoyed your sharing for some time, looking forward to more. It looks like yammy jelly, and I think this will be a perfect food item in the morning and for my Tiffin. Thanks for this. Asian recipe is the best that is why I always love Asian foods. Thanks for sharing it. I fell in love with yuzu when I visited Japan last year. My homestay host had a yuzu tree and she put the yuzu in the ofuro to scent the bathwater! I've never seen a fresh yuzu in Berlin, where I live, but I did find the Korean version of the tea described above, and I'm pretty sure it was yuzu and not some other kind of citron. The picture on the jar and the fragrance were unmistakable! Talking about sugar... I was wondering if you could explain or do a post on all the types available at the local supermarket. I want to make the yuzu cha, and as I stand at the sugar aisle, I am lost. What is the brown rocks stuff, from Okinawa maybe - papelon? Love your blog! Such awesome everything! I know this is probably a dumb question, but I just wanted to double check: once the yuzu is cut up and frozen, and stuck in a jar with sugar, is it kept at room temperature? or is it stuck back in the fridge? It sounded like room temperature, but I just wanted to be sure. I live in Noerthern California and a couple of years ago we planted a Yuzu tree. The first year we had a lot of fruit, but I didn't know what to do with them and it was wasted. This year, because of the drought, we won't have any as we have had to cut back our watering. I am saving your recipe for the future, when we hope to be able to water our garden adequately.